The Fielders KingFlor® RF55® excels in structural performance due to the patented ReLok® corner embossments that create a mechanical interlock with concrete slabs. 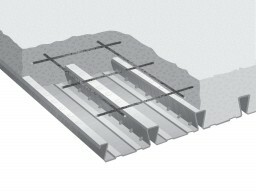 It is a traditional re-entrant profile that provides unmatched performance in suspended concrete slabs. It also possess dovetail lapping ribs which resist lateral deflection to enhance the profile’s spanning capacity and strength in positive bending and end shear. Fielders RF55® is the perfect choice for multilevel car parks, high rise buildings and shopping centres. The Masonic Centre in central Sydney attracted industry interest due to its unique structure of 24 stories with a total floor area of 24,000m2 and its inverted pyramid design. Engineering feats were necessary before this design could be realised and only the RF55® was up to the task of this outstanding architectural design and construction achievement. The RF55® is also widely known for its cost saving benefits due to its incredible spans, minimal propping requirements, reduction in site congestion and labour expenses. Fielders KingFlor® Designer 5 is a comprehensive and reliable way to design and specify every aspect of your suspended composite slab. Download a free copy of the software today.